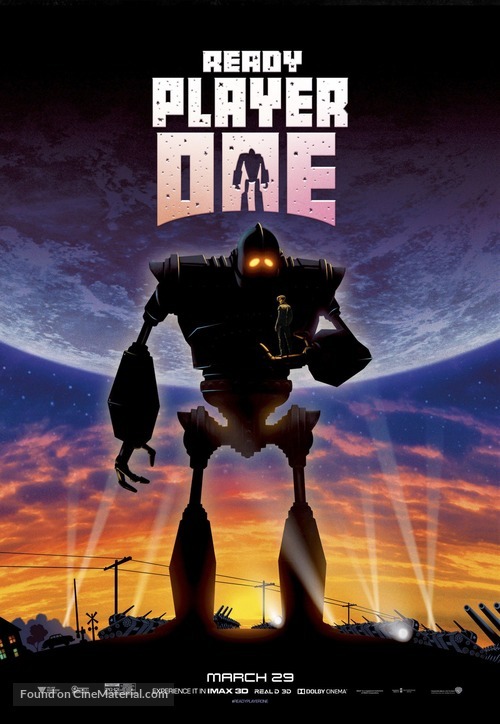 Based on the best selling book of the same title, Steven Spielberg’s new directorial effort is the CGI heavy Ready Player One, which if nothing else, shows how amazing Spielberg is at compiling character’s rights for a movie. Not sure how he was able to navigate the rights issue, but there seemed to be no lack of nostalgic characters in the world of the Oasis, the futuristic virtual reality that most of the human race escapes into to avoid how terrible their lives are in the real world. Steve Jobs-like creator James Halliday (Mark Rylance) has died and he pulled a Willy Wonka on the world. He hid three keys in his VR World and said that anyone who could find them would be given all of his money and the rights to control the Oasis however they choose. Problem? No one can solve the riddles. Enter our hero- Wade Watts (Tye Sheridan), who, as his avatar Parzival, enters the game with his own desire to find the keys. While inside the VR, Parzival meets Art3mis (Olivia Cooke) and he immediately falls for the hot gamer chick. However, he has no time for romance because the evil corporation IOI, led by evil CEO Sorrento (Ben Mendelsohn) is also hot on the trail of the keys for their own nefarious purposes (mainly dealing with advertisements a la Net Neutrality). I have mixed feelings about this movie. There was just something about the film that I did not enjoy. It was extremely long, and felt it too. The first half of the movie felt like an exposition-heavy, info dump that I found very dull. I understand that it is challenging for a movie with this much of a mythology to introduce said mythology to the audience without it feeling like an exposition dump, but I feel that someone the caliber of Spielberg could have found a more successful way to do it. The villain of the story came off to me as unbelievably one note. I thought Sorrento was nothing more than an evil corporate figure. They tried to connect him to Halliday in flashbacks, but none of those were very effective. I was not a fan of the dialogue used by the characters, particularly in the Oasis. The different avatars were clunky and undeveloped and most of the humor hit the skids. I also found much of the film predictable and lacking the adventurous spirit that I had hoped it would have. There were some things that I did enjoy. There were a couple of the big set action pieces that were effective. I did not hate the race for the first key. I loved the trip to the Outlook Hotel for the second key and the third act super slugfest was fun. The biggest reason these were fun was the nostalgic factor. It was fun seeing these different characters and objects appearing here. The film had everything from the Deloreon to the iron Giant to Batgirl, TMNT, King Kong etc. It was a feast for the eyes trying to spot all the different characters that were seen on screen. I did love the use of a certain character by the villain in the third act, even though his use of that character did not really fir with the villain’s character. I really did like Olivia Cooke in this role as well. She was so sweet and lovely that I was charmed by here the entire time. I preferred her real world persona to the avatar in the game. Tye Sheridan was fine as Wade, which is about the best thing I can say. I liked his avatar much more. The rest of the group of kids and gamers were pretty underwhelming, if not basic stereotypes. If you think too much about ready Player One, the story and the common sense falls apart. It works much better if you just do not think about it and allow yourself to fall into the days of your youth. This felt like one of those 1980s movies that I would have loved when I was younger, but not like near as much when I looked back upon it as an adult. Something bugged me about the film through much of the run time and I could not put my finger on it. There were definitely sections that I liked about the movie, but that nagging feeling just never fully went away.